Cathie McGoran was working at Olympic Dam inspecting heavy machinery when the urge kicked in to help others. Surrounded by fly-in-fly-out workers, Cathie watched social isolation, roster patterns and the strain of living away from family and friends take its toll. “I would constantly have the blokes coming into my office to talk about their problems,’’ she says. “A couple of them were suicidal and that’s when I really felt like I wanted to do something; that I should be helping people, not inspecting big machinery. A move to Adelaide and a stint in regulations at Aerotech followed before Cathie commenced her Certificate III and IV and Diploma in Community Services. After a successful student placement with Outer North Youth Homelessness Service, Cathie joined Centacare full-time. 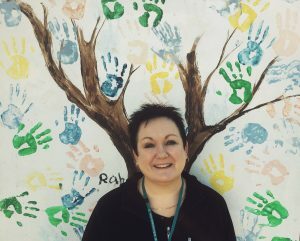 A Youth Case Worker, she is now the primary daytime support worker for young people at Carlow Place, a specialist homelessness service, based at Elizabeth. At Carlow, clients aged 16 to 18 years are supported to review and address life circumstances that have led to homelessness or placed them at risk. “My parents have been married for fifty odd years. I know how supported and loved and accepted I was, and it breaks my heart to see these young people, at their age, don’t have that. Cathie’s approach is simple: listen to the young people, encourage them to dream, and support them to get their health on track. “I just want to catch them up so that before they leave here, they know that they’re healthy and that they’ve got supports around them for their mental health and education. “The things that keep me going are the little wins: When they get up and go to school, and they feel comfortable just to hang out, or they get their driver’s licence. In Homelessness Week, Cathie is urging the community to be more compassionate and understanding. “Just take a step back. You wouldn’t want to be in their shoes. “People assume they are on drugs and doing whatever, but they are not the problem. Sometimes it’s their whole situation – a lifetime of a problem. Cathie’s role is being highlighted as part of Homelessness Week, an annual week coordinated by Homelessness Australia to raise awareness of people experiencing homelessness, the issues they face and the action needed to achieve enduring solutions.